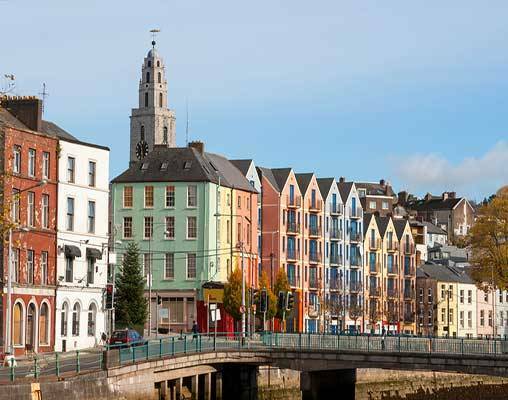 Ancient legends, inspiring natural beauty and vibrant cities - see the highlights of this beautiful country with a complete journey through Ireland. Book a six-night journey for travel in July and September 2019 and save 25% on your companion's fare. Book by April 30, 2019. Offer is subject to availability and may be removed at any time. Call to book by April 30, 2019. Offer cannot be combined and are only valid on new bookings. Offer is not applicable for parties of 12 or more. Tours from Dublin on the Belmond Grand Hibernian train are sure to stay with you for a lifetime. Let yourself be captivated by the charms of the Emerald Isle as you journey in peerless luxury. Anticipate a journey accentuated by magical encounters, world-class cuisine and exceptional service. Board the train in Dublin in the early afternoon, and savour a delicious afternoon tea as the train begins its journey. Arrive in Cork and visit the Jameson Experience. A private tour explores the history of the whiskey-making process, before guests are invited to participate in a tasting session. Back on board, your first dinner is served as the train continues to Charleville, where it will stable for the night to ensure a good night's rest. Overnight train. The day starts out with a private tour of Blarney Castle & Gardens where guests will have the opportunity to kiss the legendary Blarney Stone. Enjoy morning coffee in the Blarney House. Lunch is served on board before continuing to the Lakes of Killarney. A pony-and-trap tour is followed by a boating excursion across Lough Leane. Head back to the train for dinner. Overnight train. This morning your journey continues north to Galway for a tour. Lying on the River Corrib, let yourself be enchanted by this romantic city. Lunch will be served at a local restaurant. Champagne and oysters set the scene for a fun-filled afternoon. Return to the train for dinner as the train continues on to Athlone. Overnight train. Breakfast is served as the train continues to Dublin, its final destination. Disembark for your onward travel arrangements. 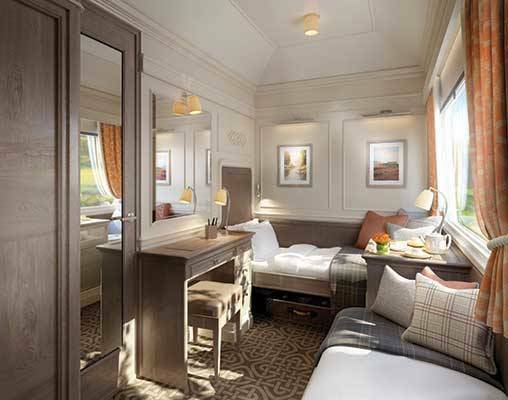 The Belmond Grand Hibernian boasts accommodation for up to 40 guests in elegant, private en-suite cabins. Design draws inspiration from Dublin’s classic Georgian architecture, blended with elements of ancient folklore and tradition. The Observation Car brims with the warm atmosphere and elegance of a Dublin saloon. It is the perfect place to mingle with fellow travelers, listen to live musicians and animated storytellers or participate in craft sessions. Take a seat, with a glass of fine Irish whiskey or a pint of local stout, and watch the enchanting scenery from the many large windows. 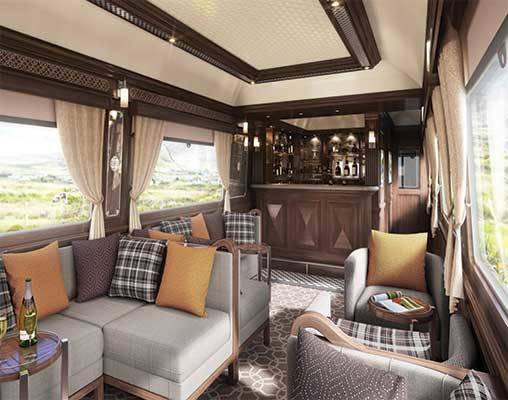 The train offers 16 twin and four double cabins for truly indulgent train ride vacations. All cabins are en-suite, with additional features including a wardrobe, writing desk and chair. Large windows let you admire the verdant landscape as it unfolds. All double cabins can interconnect with twin cabins, making them an ideal option for families travelling together. The train also offers a cabin suitable for guests with limited mobility, specifically designed to allow wheelchair access into the cabin and en-suite bathroom. From wonderful artisan cheeses and superb smoked fish to the freshest seasonal vegetables, the onboard menus feature the finest ingredients from the regions the train travels through. 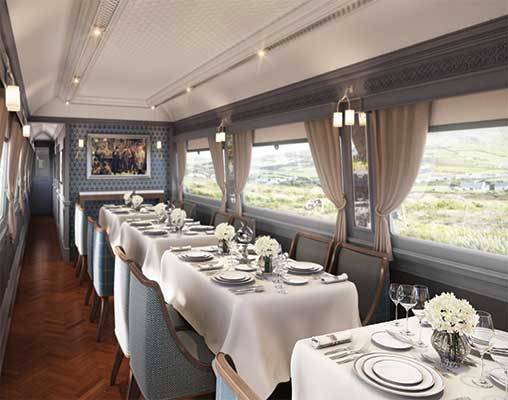 The chef and his team serve breakfasts, lunches and dinners in two air-conditioned dining carriages named after Irish counties. 23rd April 2019 $9,516 Please call for availability. 30th April 2019 $9,516 Please call for availability. Enter your details below if you would like to be notified when 2021 dates and prices are available for Grand Hibernian - Grand Tour of Ireland. Prices are land-only, per person based on double occupancy. Single occupancy pricing available on select departure dates, please speak to a rail specialist for details. Pricing is in USD, based on international exchange rate on March 18, 2019 and can vary based on the exchange rate at the time of booking. Prices are correct at the time of this web page going live; however are subject to confirmation at time of booking.